Most of us are not all called to leave our jobs and homes and follow Christ, but part of being Christian is listening to Him when He does call us to give things up. Sometimes He calls us to watch less TV or use social media less and spend more time in prayer. Sometimes He calls us to give up our favorite food for a time in order to focus on loving Him more. Sometimes He calls to fast regularly to learn how to be more temperate in our whole life. Sometimes He calls us to limit certain friendships that keep us from loving Him. Sometimes He calls us to give up certain habits because we have made idols of them. Sometimes He calls us to sacrifice our time to give to friends and family in need. Are you able to give it all up to follow Him? Saint Paul in the reading from 1 Corinthians tells us that “time is running out”—we need to change the way we act. (1 Corinthians 7:29-31) If our spouse, if our friends, if our sorrows, if our joys, if our material things, or if the world are keeping us from following God, then it is time to reprioritize. All of the good things in our lives are only good if they help us follow and love God. We are supposed to love God most of all, and only these things as much as they help us to love Him. 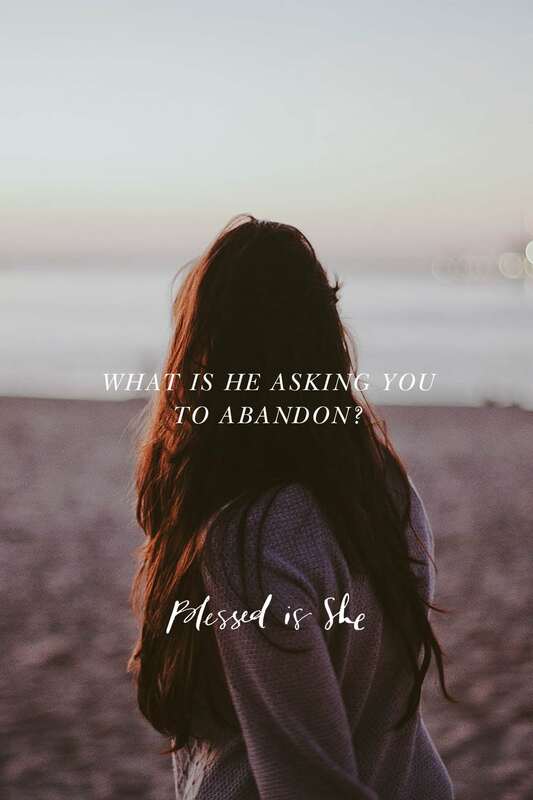 What is keeping you from loving Him today? When Christ says to you today in the Gospel, “Come after me, I will make you a fishers of men,” what is He asking you to abandon? (Mark 1:17) What is keeping you from proclaiming the Gospel with your life? Take some time to pray with this Gospel today, and ask God how you can strip your life of all that distracts you from Him and bring you closer to Him. Susanna Spencer is the Theological Editor for Blessed is She who studied theology and philosophy in her earlier life. She happily cares for her three adorable little girls, toddler boy, and her dear husband in Saint Paul when not writing and editing. She loves beautiful liturgies, cooking delicious meals, baking amazing sweets, reading good books, raising her children, casually following baseball, and talking to her philosopher husband. You can find out more about her here. Susanna, I LOVE this! My word for the year is abandon and I have been looking at not only what in my life I need to abandon, but also how to love God with abandon. Thank you for sharing this!